Aktionstag am 14. Juli auf dem Schlossplatz in Erlangen. Die Welt ist in Bewegung – egal ob in Ägypten, Griechenland oder den USA. Überall gehen Menschen auf die Straße, diskutieren und protestieren. Angesichts sozialer Ungerechtigkeit, Verarmung breiter Bevölkerungsschichten, Umweltzerstörung, Demokratieabbau und Kriegen ist eines klar – es wird kritisch! Die weltweite Unzufriedenheit und Empörung wächst und immer mehr Menschen hinterfragen grundlegend, was um sie herum passiert und werden selbst aktiv. Diese Bewegung möchten wir auch nach Erlangen tragen und laden alle interessierten Menschen zu einem Aktionstag mit interaktiven Workshops auf dem Schlossplatz ein. Diese werden vielfältige Themen wie Kapitalismuskritik, Demokratie, Krisenpolitik, Nachhaltigen Konsum, Möglichkeiten der gesellschaftlichen Veränderung und Bedingungsloses Grundeinkommen haben. Zusammen möchten wir verschiedene Aspekte der momentanen Lage diskutieren, uns kreativ und kritisch damit auseinandersetzen und austauschen. Damit ist der Wunsch verbunden, Menschen zusammen zum Nachdenken und auf neue Ideen zu bringen und einen Ausgangspunkt für weitere Aktionen zu setzen. Hinkommen, mitreden und mitmachen – denn nur gemeinsam können wir das Ganze verändern! Das “Jetzt wird’s kritisch!”-Bündnis sind (alphabetisch) Attac Erlangen, Banda Sinistra, der Dritte Welt Laden Erlangen, das Erlanger Sozialforum, die Grüne Hochschulgruppe Erlangen-Nürnberg, die Jusos Erlangen, LUKS, Occupy Erlangen und weitere Individuen. This entry was posted in Uncategorized on July 14, 2012 by Noya. We call for European days of protest against the European Union’s crisis regime in Frankfurt am Main from May 16-19. We intend to carry the resistance against the EU crisis regime, which is currently hurling millions of Europeans of different nations into poverty and distress, to one of the wellsprings of the crisis: right into the middle of the Frankfurt banking district, the seat of the European Central Bank (ECB) and numerous powerful German banks and corporations. We object to all attempts to use nationalist slogans to set employed, unemployed and precariously employed people against each other, no matter whether they live in Germany or Greece, in Italy, France or in other countries. We take a stand for solidarity with the people and movements all over Europe that have been fighting against the attack on their lives and their future in the past months. 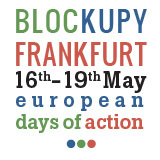 We will demonstrate against the policies of the EU and the Troika and block the ECB and occupy public places in the Frankfurt banking district: We are BLOCKUPY! The North African uprisings of the past year have swayed power structures that had been cemented into place over decades. Everywhere on the globe, this rallying cry for a new start has energized people and inspired them with courage. In the USA and in Europe, too, tents have become symbols of protest. In Spain tens of thousands have occupied the central squares and called for “Real Democracy Now!” In Tel Aviv, entire streets were transfigured into camps, and huge rallies placed rising living costs center stage. In Greece, enforced public spending cuts and other neoliberal outrages met with a response of mass uprisings and a series of general strikes. Initiated by Occupy Wall Street and seemingly out of nowhere, a worldwide movement against the rollback of democracy and attacks on social security and public services has formed. Worldwide, hundreds of thousands have taken to the streets to protest internet censorship. The camp at the site of the European Central Bank in Frankfurt continues to exist. In numerous countries of the European Union, movements and protests are targeting the massive spending cuts imposed by governments of all political persuasions. Wages are reduced, retirement age is hiked up, jobs in the public sector are slashed and public services are closed down by the dozens. In nearly all countries, there are cutbacks in health services and education. Of the billions used to “rescue” the euro, not a cent goes to the people in the affected countries. Instead, the lion’s share flows back to the banks themselves. The austerity policies imposed by the EU Troika, consisting of the Commission of the EU, the European Central Bank (ECB) and the International Monetary Fund (IMF) and dominated by the German and French governments, amounts to a de facto abolition of democratic procedures. In Greece and Italy, for instance, “technocratic governments” have been installed, whose task is reduced to simply implementing the austerity policies from Brussels. Let’s counter their austerity politics with our solidarity! Let’s show loud and clear that we are not going to stand by while the consequences of the crisis are placed on the shoulders of working, unemployed and retired people, as well as students, refugees and many others, whether elsewhere or right here. The Frankfurt days of protest follow right on the global action day on May 12 and the anniversary of the first asamblea in Madrid. At the same time, there will be direct action against the G8 summit that has already been moved from Chicago to Camp David due to worries regarding protests. On May 17, we will occupy the parks and central squares of the city of Frankfurt, creating space for our discussions and exchange of ideas. On May 18, we will block the regular business operations of the Frankfurt banks to give our anger over the Troika’s policies a tangible shape. To bring home the protests’ broad base, we will gather for a final mass rally on May 19. Traveling from various countries and regions, people will converge in Frankfurt to join the days of protest. BLOCKUPY FRANKFURT, is a movement of groups and activists from the occupy movement, from jobless initiatives and crisis action groups, trade unionists, of activists from Attac, from environmental, peace action, anti-racist, immigrant and anti-fascist initiatives, of groups and organizations of the radical left, youth and student organizations and of activists of diverse local struggles and from left parties. This entry was posted in Uncategorized on May 16, 2012 by Noya.